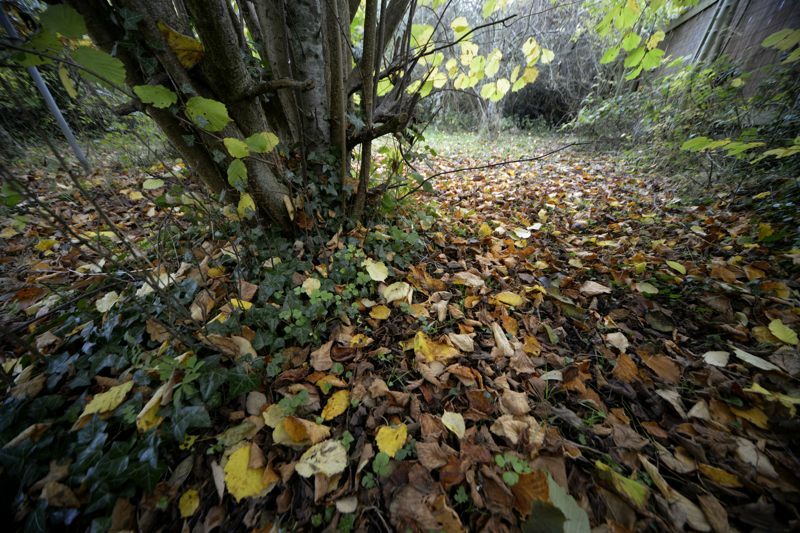 Our Hazel, dark and massive and still with a few pale leaves, stands proud of its autumn carpet; 18 Nov 2013. 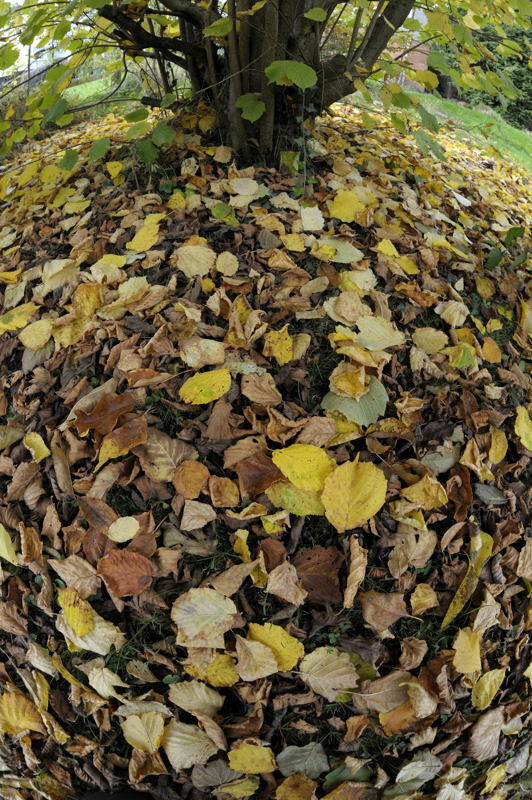 The extreme wideangle lens is pointing downwards, and the leaves in the foreground appear to be close under the camera. Everything left of centre leans out towards the left, and everything to the right (including our fence, top right) vice versa. I think I prefer the colour version here, its how it was or, rather, its what I saw through the viewfinder – and I love this garden and its autumn colours. The mono version is quite different. Its much darker, its really built around darkness, darkness that is cut / illuminated by those white leaves, both sprinkled across the ground and still hanging from the tree. Both versions would benefit from larger reproduction I think, the mono version more so. Click onto the images to open larger versions in separate windows. Technique: D800 with Sigma 12-24 lens at 12mm; 800 ISO; the mono version created with Silver Efex Pro 2’s Floral Style preset. UPDATE: my apologies for not visiting others’ blogs as often as usual, but time is tight at the moment. Low, early morning sunlight blasts up through the garden, blinding the Hazel tree, my camera and me; 9 July 2013. Moments like this, out there with Nature in the raw, are exhilarating. The sun came through the trees and I winced, recoiling from the glare, just pointing the camera directly into it and firing. 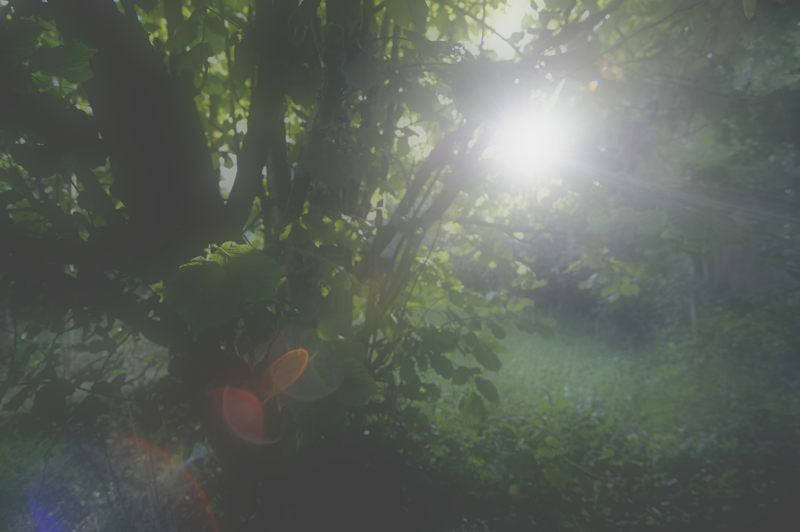 Yes its soft – aided by some Gaussian blur – and yes its flare heaven, but this powerfully reminds me of what the moment was like, and that’s the thing. 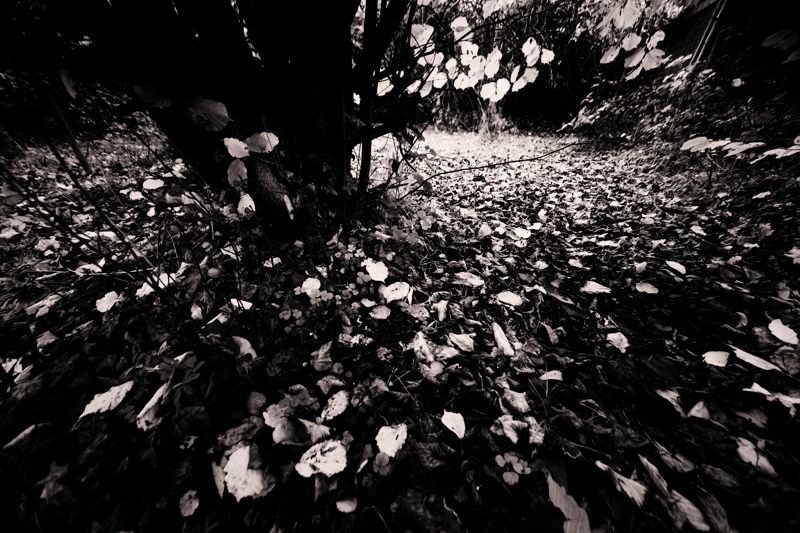 It felt as if everything was being buffeted by the light – but there was the Hazel, solid and upright up ahead and, totally dazzled, I sought its shadows. D700 with 16-35 Nikkor at 16mm; 200 ISO. Hazel shoots beside reeds; Chew Valley Lake, Somerset; 15 May 2015. 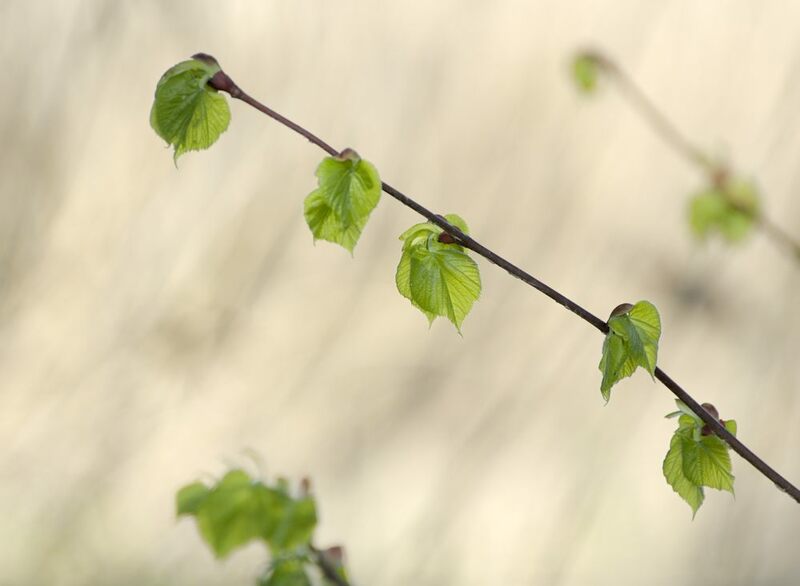 A spring morning, and young hazel shoots rise up from the drier ground beside one of the lake’s fringing reed beds. The glowing greens of the young leaves are really the thing here, and so a shallow depth of focus reduces the reeds’ hard linear shapes to the softest of dark, streaked blurs. D700 with 70-300 Nikkor at 300mm; 400 ISO. D700 with 70-300 Nikkor at 300mm; 250 ISO. D700 with Sigma 15mm full frame fisheye; 800 ISO. 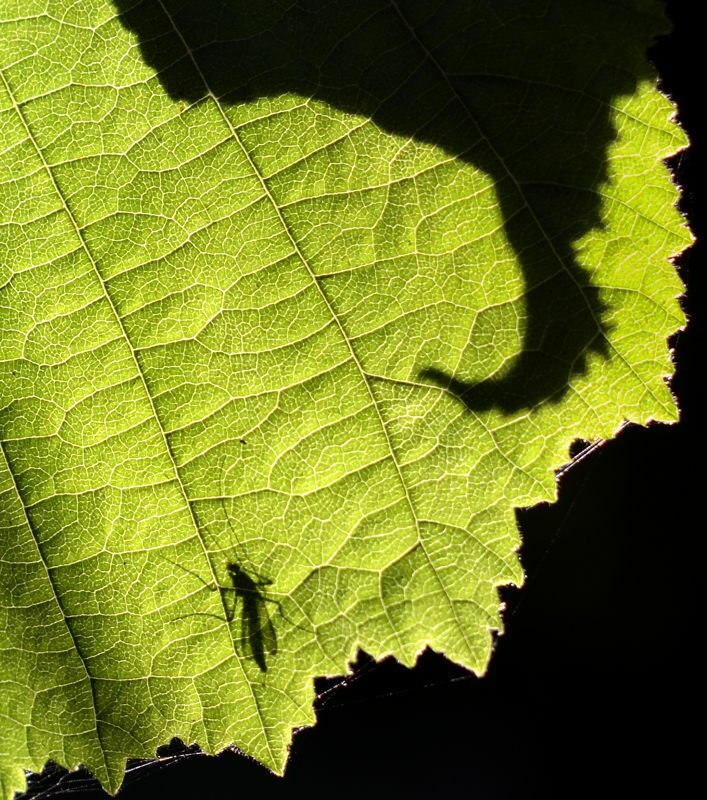 Shadow of a fly, on a leaf caught in the rays of the rising sun; 10 July 2014. 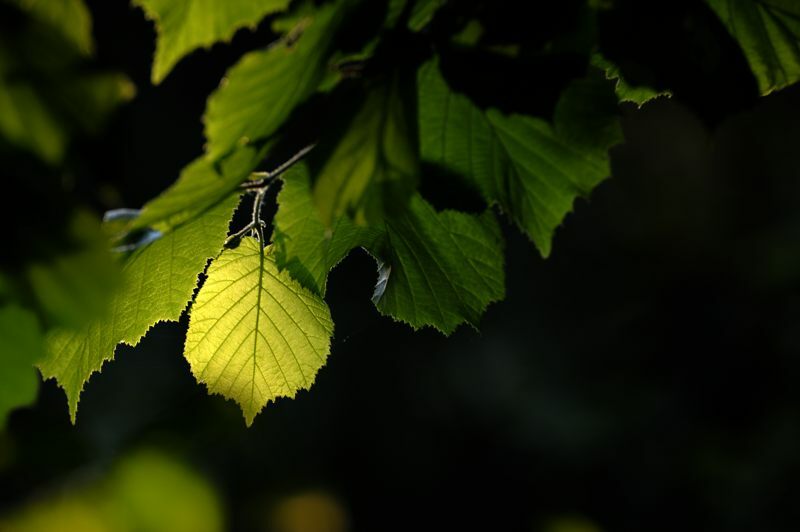 A hazel leaf in our back garden is caught in the blast of the morning sun’s low angle rays and glows brightly. Another leaf to sunward throws a long curving shadow across it, and tiny strands of webs light up brightly around its edges. It looks rather like a map of England with East Anglia’s bulge – but towards upper right there is also a great peninsula heading off into Doggerland, that stretch of country, now beneath the North Sea, that was dry land back in the days when Britain was part of continental Europe. And there is the shadow of an insect – it resembles a mosquito but I don’t know if that’s what it is – at rest on the other side of the leaf, basking in the morning’s warming rays. Peace, quiet and bright warmth, in our garden. D800 with 50mm Nikkor used in DX format to give 75mm; 100 ISO.  A second look through our hazel towards the rising sun, with an f1.4 lens wide open and defocused; 10 July 2014. The first of these pictures is here. D800 with 50mm Nikkor used in DX format at 75mm; 100 ISO. 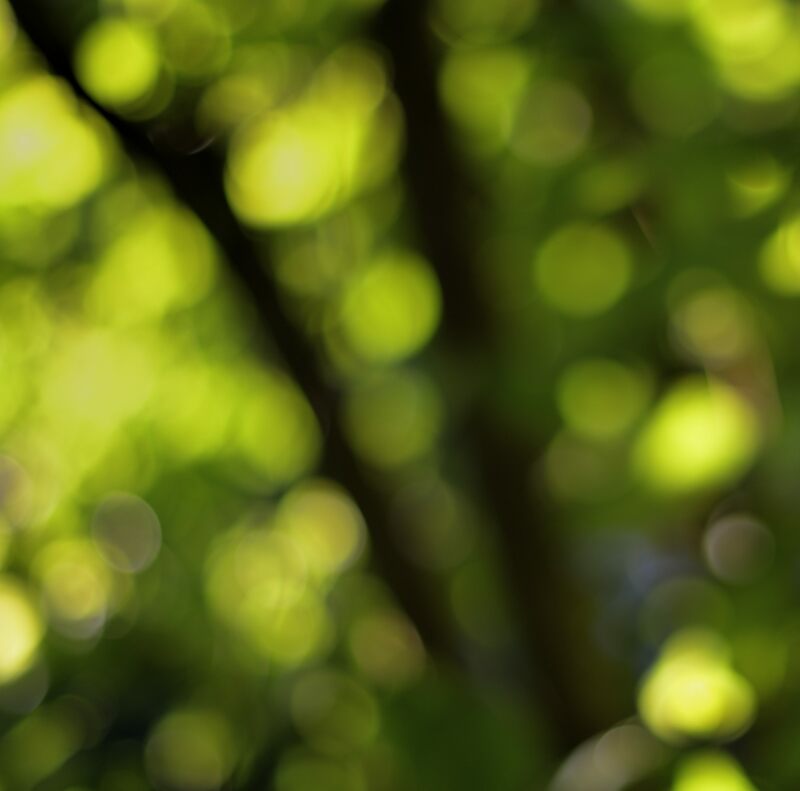 Looking through our hazel towards the rising sun, with an f1.4 lens wide open and defocused; 10 July 2014. I bought a 50mm f1.4 Nikkor lens sometime back, meaning to use it in some really low light situations, but have used it hardly at all. Reasons? Well, I haven’t been in any really low light situations (does that get me off the hook?! 🙂 ). And, also, 50mm, being not too far from the visual angle of the human eye, is just not a lens length I use much – I’m usually way above it in telephoto or way below it with wide angles. The D800 is a full (i.e. 35mm) frame camera, but it allows use of just a part of that full frame in what Nikon calls DX format, which magnifies lens focal length by 1.5. So using the 50mm on the D800 in DX format produces a (1.5×50) = 75mm lens, which still retains the very handy f1.4 aperture. And a few days back I spent some time in our wonderfully warm garden with this 75mm f1.4 lens, and two pictures from this session have already appeared – they are here and here. I didn’t use the f1.4 aperture and its limited depth of focus for these two earlier shots, but for the one above I did – and then I pointed the lens into the sunstruck tree and manually defocused it – throwing the focus out so that all of the translucent detail became very soft and glowing. What can be seen in this now abstract image? Dark lines cutting softly through the glow are three of the hazel’s many slim and straight trunks. And the glowing orbs are the tree’s leaves, lit up by the low angle sunlight – and looking very like fairy lights. The dark trunks channel my eye down towards lower right as they converge, whereas the fairy lights, being brighter over towards the left, draw my eye over there, too.